Prelude: Legal stuff first as always. 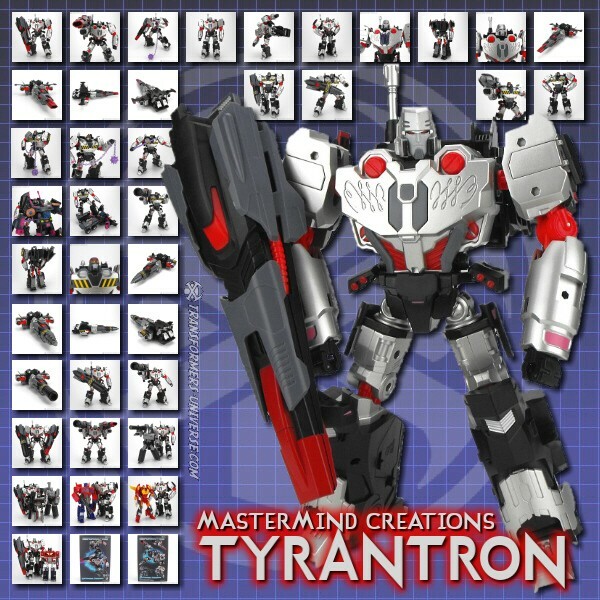 Tyrantron is not a figure released by Hasbro nor Takara-Tomy and thus not officially a Transformers toy. He hails form third party company Mastermind Creations and depicts Megatron as he currently appears in the IDW comics, but for legal reasons he can’t be called by that name. Robot Mode: Tyrantron is a pretty big robot, by Hasbro standards he’s probably be considered Ultra-Class. It’s easy to see that he is supposed to be Megatron, as he has the classic bucket helmet, the big gun on the arm, the silver and black coloring, and even those squiggly lines on his chest that harken back to his original Walther P-38 mode. There is even a smaller gun barrel sticking out behind his back, hinting at the original gun mode’s gun barrel. He clearly doesn’t transform into a gun, though, having tank tracks on the back of his arms and legs. Nearly unnoticeable are the two folded wings on his shoulders, which hint at a flying alternate mode. Personally I like the look of this Megatron very much. He looks powerful, but lean. The face sculpt is very nicely done. Articulation is excellent and leaves no room for complaint. He also comes with Megatron’s traditional add-on weapons, a purple energy Morning star and a purple energy sword (seen in the first season of the cartoon and the 1986 movie respectively). The kicker of the robot mode is, of course, that it’s actually two robot modes in one. Present-day warlord Megatron can change into long-ago lowly miner Megatron. You switch out the head, chest plate, shoulder pieces, and arm cannon, and suddenly you have a robot that is still clearly the same guy, but looking decidedly different. Instead of a cannon he now carries a big drill on his arm and a small drill takes the place of the smaller gun barrel on his back. Oh, this mode is actually called Tyrantronus, not Tyrantron (harkening back to the idea that Megatron was originally called Megatronus, named after one of the original 13 Primes). To slowly transform miner Megatron into warlord Megatron, you can replace the drill piece on his arm with a gun barrel that strongly resembles the silencer from his original gun mode. Since Tyrantron(us) can actually carry his big gun / drill on either arm, it’s even possible to make him wield two giant guns all at once, if you’re so inclined. Bottom line: an excellent robot mode. I wouldn’t go so far as to call it two robot modes because it’s clearly still the same guy, but the switch from miner to warlord works great and gives you plenty of options. Add in the extra weapons and the robot mode offers lots of fun. Alternate Mode: I don’t believe we’ve actually seen Megatron transform into alternate mode since he became part of the main cast of More Than Meets the Eye / Lost Light and started wearing this body here, so the designers were pretty free here. Tyrantron transforms into a space jet somewhat resembling that of Animated Megatron. The big gun serves as the nose of the jet, the small wings unfold and the tank tracks serve as landing gear. It’s not a terribly intricate alternate mode, but it works quite well. Just like the robot mode the vehicle mode, too, can be slightly changed. Since Megatron used to be a miner, his alternate mode here is a drilling vehicle. Gone are the wings, replaced by yellow-and-black striped warning plates. The jet nose is replaced by a drill and… yeah, that’s pretty much it. To tell the truth it still looks more like some kind of space jet than a mining vehicle, but it is somewhat recognizable for what it’s supposed to be. So while the “transformation” from present-day to days-of-yore alternate mode doesn’t work as well here as it does in robot mode, I still award some points for effort. Bottom line, though: the alternate modes aren’t bad, but certainly not the reason to buy this figure. Accessories: Aside from the aforementioned accessories that come with Tyrantron for his two robot and vehicle modes, he also comes with a new head, complete with face mask, for the previous MMC figure Kultur (aka Tarn). Seeing as Tarn’s true identity wasn’t known by the time the original figure came out, you can now put the head of Glitch (his original identity) on the Kultur body and remove the face mask at will. Tyrantron can also carry the face mask (aka the Decepticon symbol) on his chest, held in place by a magnet. Remarks: In the IDW comics More than Meets the Eye / Lost Light author James Roberts managed the feat of turning Megatron, usually the stereotypical evil overlord, into an almost sympathetic character. Flashbacks showed Megatron’s beginnings as a humble miner who, at first, planned to change the Cybertronian caste system through non-violent means. His evolution into a fanatical warlord and his path to redemption were painted with care and now Megatron is exiled on a parallel world that never saw an uprising against the caste system, where he looks to repeat history (though without a genocidal galaxy-wide war this time). Tyrantron is far from the first figure MMC did based on the IDW comics and it works pretty well, all in all. The alternate modes aren’t that spectacular, but the robot mode(s) work pretty well and it’s easily the best-looking Megatron figure in my collection right now. Recommended to Megatron fans who are not put off by the third party price.